The scientists in Jurassic Park needed a full set of plans for each dinosaur they brought back to life. If I was going to bring a semi-extinct wooden boat like Cabin Boy to life, I would need plans, too. And darn simple ones. The 'plans' for dinosaurs -- as indeed for all living organisms -- were written down or encoded in DNA long ago. DNA is pretty fragile stuff and the 'plans' for 99.9% of the species that have roamed the earth are now lost forever. But in the movie, billionaire John Hammond and the rest of his doomed team were able to recover the plans (i.e. DNA in dinosaur blood) from the stomachs of mosquitoes trapped and preserved in amber. Roll the mayhem and chaos. The plans for the 99.8% of wooden boats built in the last few thousand years have also been lost forever. And the loss would have been higher if it wasn't for the Great Depression. A New Deal project called The Historic American Merchant Marine Survey was established to study and preserve American naval history. The head of the New England section of the Survey, Howard I. Chapelle, documented many of the wooden boats that were, even then, rapidly disappearing. 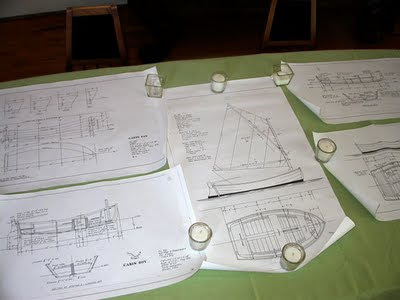 These plans are now preserved in Chapelle's classic books like American Small Sailing Craft , in museums like the Smithsonian and The Museum of America and the Sea at Mystic, and by the families of some of the great wooden boat designers. By the way, the final report of the Survey, The Historic American Merchant Marine Survey (HAMMS): Works Progress Administration, Federal Project No. 6 - Historic American Merchant Marine Survey, containing over 1000 scale drawings of historic ships, was the 9th most expensive book sold on ABE Books in May 2009. It sold for $3500. Luckily for me, Mrs. Pat Atkin still carries on the family business after the passing of her husband John in 1999. She even has a website, atkinboatplans.com, which itself helps illustrate the amazing diversity of old wooden boats. Highly recommended. Mrs. Atkin doesn't take credit cards or online orders, though, preferring more traditional means of payment. So after dusting off my check book (talk about dinosaurs) and quill pen, I dispatched my order via the Post, and two weeks later, received a tube containing plans spread over 5 sheets of old-fashioned paper. And what a thrill it was to spread them out on my dining room table. Old John Hammond himself couldn't have been more excited. 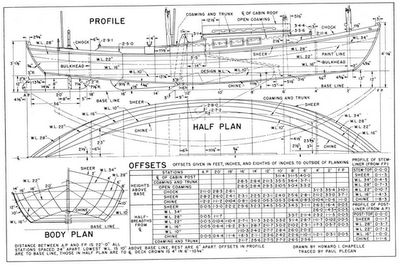 But the purpose of small-scale paper plans is to efficiently encode the information needed to build a boat. To actually construct it, the builder needs a set of full-size plans. And lofting -- the act of turning easily storeable and mailable small-scale plans into full-scale building plans -- is said to be the task that separates the Wooden Boat Dreamers from the Doers. Having spent more than a fair share of my life dreaming, I was determined to become one of the Doers. Well get to it! the sooner its done. the sooner the boat gets finished. Another WBF'r here. I'm enjoying your blog too. 1) Buy a 4x8 sheet 3/8" marine plywood to loft the boat. Then you can use it to plank the bottom instead of all the cedar cross planks. That will save time, weight and leaks. 2) Use PL Premium glue. Lofting is covered in the West System manual too. You know, lofting a sea kayak is very difficult. Perhaps it is because the curves are so modest.